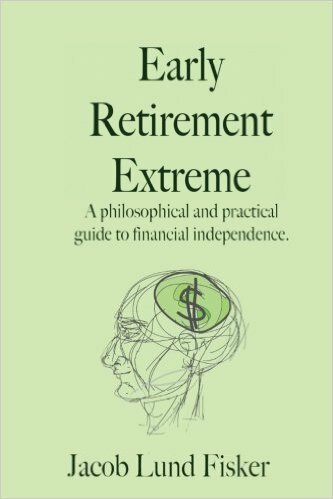 Early Retirement Extreme by Jacob Lund-Fisker offers a critical intellectual framework for rethinking your approach to retirement that would allow someone on the median salary to retire several years earlier, and the more you earn, the earlier you should be able to achieve this goal. The book has helped me (on £40+K) to work out an 8-12 year early retirement plan, which I'll post on later. The book's well worth a read, but the the blog's also worth checking out. Early Retirement Extreme is not a step by step guide about how to achieve early retirement. It is a critique of the paucity of normative ways of thinking about work-consumption-retirement and an overview of an alternative way of thinking about this nexus which ultimately means working and consuming less and retiring a lot earlier than normal. If I could pick one single stand-out idea which captures the ethos of the book it is this: If your current yearly income is £10 000 and you spend 75% and save 25%, it will take you 3 years to accumulate enough savings to take 1 year off. If you invert this ratio by spending 25% and saving 75% then after 3 years you can take 9 years off. While this hypothetical example doesn't factor in real-life variables such what you might actually be earning, or inflation or interest on savings, it does illustrate the central principle of the book – Whatever your income, if you get used to living on as little money as possible and save as much as possible, then you will be able to retire A LOT earlier than the norm. In this model, early retirement will also require you to invest sensibly (this is not an anti-capitalist manifesto!) and develop a range of skills (social, physical, practical and technical) which will make you a more resilient person who is able to meet their downward-adjusted needs and wants with much less money. By saving 75% of his income Fisker managed to become financially independent in five years, and the blog recommends that you aim to save at least 40-60% of your income to make early retirement possible (I've managed 56%). In Fisker's model, the first step to early retirement is to get over the habitual way of thinking about work as something we do for 40 years, and to get over the idea that a high-level of consumption is what we do with those small chunks of time when we are not working. In his view, many of the consumer goods and services which are regarded as normal have little real value, and as examples he lists everything from kitchen gadgets to gym memberships but also cars and higher education. Instead of working-consuming for 40 years, Fisker suggests that we stop consuming and start saving and we spend our non-working time developing 'resilience skills' which will make us less dependent on money. He suggests four types of skill – practical (e.g. building your own house rather than paying £100K interest on a mortgage), technical (a diverse range of professional skills), physical (being able to cycle rather than needing to drive), and social (sharing a house rather than living alone). Each individual will approach early retirement in different ways depending on their own specific circumstances, and Fisker suggests that it is up to the individual to weigh up their own talents and find their own individual (or couple/ small network) path to retiring early – In this vision, thinking for yourself, and creativity are crucial. The fact that the idea of saving 75% of your income will seem unrealistic to most and down-right impossible to many is, to Fisker, simply a sign of how colonised our minds have become by societal work-consumption-retirement norms and very early on in the book Fisker contrasts his own creative 'renaissance' approach to early retirement to the slavish mentality which keeps us chained to our sub-optimal 40 hour a week/ 40 year career working norm. He uses Plato's cave analogy to illustrate how we have become wage slaves, the wall in his modern rendering of this tale representing us being trapped by the multitude of things we mistakenly think we need. However, unlike physical walls, our chains are mental, because rather than using our imagination to creatively break free of this cycle, we develop excuses which keep us locked into this cycle of a long-career and short-retirement. Fisker criticises what he casts as the 'wage-credit-spend-consume-retire on a million-cycle' – Into which we have been duped. He is especially critical of our wasteful consumption practices – we are taught to be materialists through toys from childhood and later on our mortgage-purchased houses become places in which we store stuff which goes largely unused. As briefly outlined above, rather than spending, Fisker's solution to breaking free of this cycle is simple – spend less and save like what appears to be crazy to build a relatively small retirement pot. His own version of retirement really is extreme – saving 75% of his income, it took him 5 years to retire on a third of the median income (something like $700 annually), reducing his expenditure to the very basics of life and finding creative ways to enable him to live on less. Given that he lives on $7000/ year, it seems reasonable to assume that he had an income of $30 000 over these five years of saving, meaning that he has 'retired' on an income pot of $150 000, although it will almost certainly be more than that given that he appears knowledgeable about investing. Obviously this is more than most people will be earning in their late 20s/ early 30s when he started out on his early retirement mission, but Fisker holds that it is the 75-25 ratio that is the crucial thing, and more crucially, the mindset to spend as little as you can by finding creative ways to avoid the con-of-consumption and save what remains. Just for clarity I just moved this post from the site above to Steemit - the reason I didn't delete the post entirely is so I could create a link to Steemit. Cheetah is a flawed bot.